Cleopatra constructed an elaborate temple, or Caesareum, to Julius Caesar opposite the harbor of Alexandria. Inside stood an image of the deified Caesar. Following the defeat of Marc Antony and Cleopatra and the conquest of Egypt by Octavian, this temple of Caesar was dedicated to Augustus and became an Augusteum. While it is not entirely certain what other images of his family Augustus added at this time, it is resonable to expect that he did add some members of the Julio-Claudian house. Undoubtedly, this temple was rededicated to Augustus and his portrait at least must have been added. 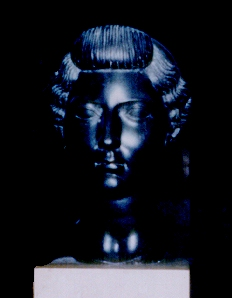 Caesar’s portrait was carved out of a very hard black bassalt stone unique to Egypt. 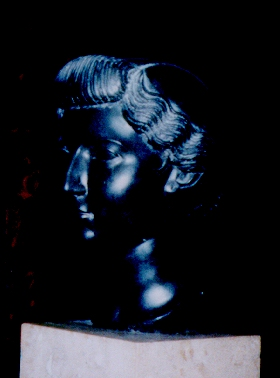 The bust of Livia shown her is also carved from the same stone and quite possibly might have found its way to France with Napoleon’s help. There are also known portraits which have survived in black bassalt from Egypt. These are of Antonia and her father Marc Antony. All of these busts which are extant today, share a common source in modern time – France. It is known that Napoleon was fascinated with Ancient Egypt and removed numerous objects including oblisks for transportation back to Paris. Thus, the black basalt busts that have survived may indeed have once stood in the famous Temple of Alexandria not too far from the tomb of Alexander The Great, for whom the city is named.